If the debut of Instant Articles didn’t make it clear, Facebook aims to be the portal through which you get most, if not all, of the information you care about. The key is convenience — people are likelier to stay on a webpage or app if it’s easier or faster to access the content they want, after all — and so Facebook’s trying to close deals with as many third-party editorial partners as it possibly can. The social network announced the latest addition to its collection of partners today: restaurant reviews. Starting today, Facebook’s adding critic’s’ reviews of restaurants to “thousands” of select pages in the United States. Articles from Bon Apetit, Conde Nast Traveler, Eater, New York Magazine, and the San Francisco Chronicle will appear next to user and friend reviews of popular establishments, presumably in much the same way Google arranges Zagat ratings in its Maps listings. The reviews will show up in both Web and mobile searches. “Since reviews are such an important part of helping people making informed decisions about what to do locally, we’re excited to be incorporating a new way for people to use Facebook to find the best real-world experiences,” a Facebook spokesperson told the Verge. For Facebook, it’s a two-pronged play: the company gets the content which it so voraciously desires and gains a leg up on the local listing competition. There’s the potential, of course, for awkward juxtapositions on the pages of businesses paying for prime placement — the company said it’ll show negative reviews provided by publishers — but Facebook seems to be mitigating that conflict by sourcing mainly from “best of” lists. 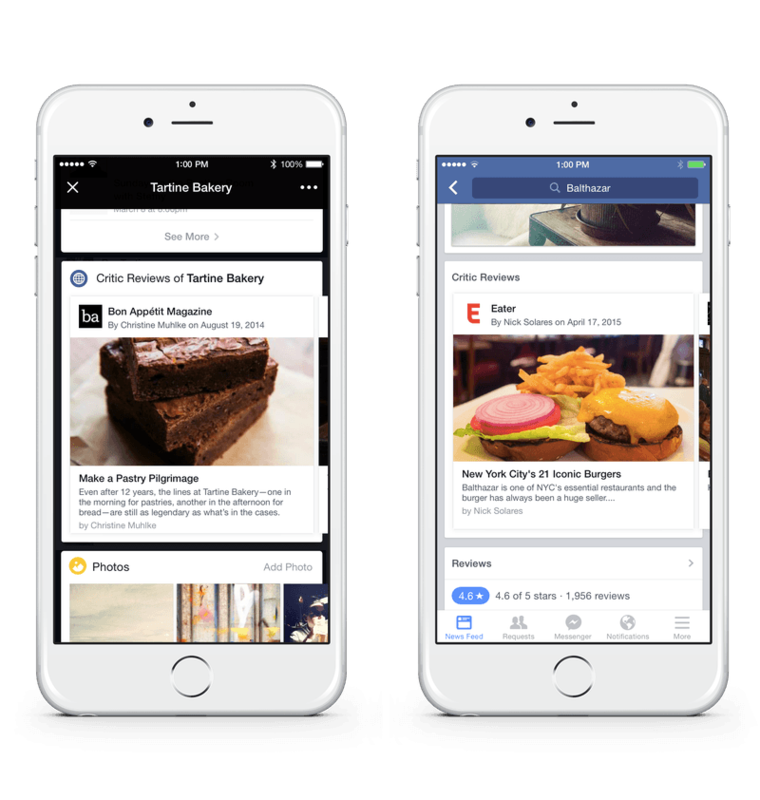 Facebook’s filtering of reviews may limit the new feature’s usefulness, but Facebook’s clearly betting “good enough” is sufficient to convince would-be Yelpers and Foursquare-ers to stay and search on Facebook for their next restaurant recommendation.